alaTest has collected and analyzed 56 reviews of Sanyo VPC-CG6. The average rating for this product is 4.2/5, compared to an average rating of 4.0/5 for other Camcorders for all reviews. People are impressed by the design and size. The price and portability also get good feedback. We analyzed user and expert ratings, product age and more factors. 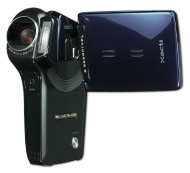 Compared to other Camcorders the Sanyo VPC-CG6 is awarded an overall alaScore™ of 77/100 = Good quality. alaTest has collected and analyzed 4 user reviews of Sanyo VPC-CG6 from Amazon.co.uk. The average user rating for this product is 4.0/5, compared to an average user rating of 4.0/5 for other Camcorders on Amazon.co.uk. alaTest has collected and analyzed 34 user reviews of Sanyo VPC-CG6 from Amazon.com. The average user rating for this product is 4.1/5, compared to an average user rating of 3.9/5 for other Camcorders on Amazon.com. Reviewers really like the design and size. The portability and price are also mentioned favorably. My buddy, who always has the newest, coolest electronic gadgets showed me his CG6 last weekend. After using it for an hour... I SIMPLY HAD TO HAVE ONE!